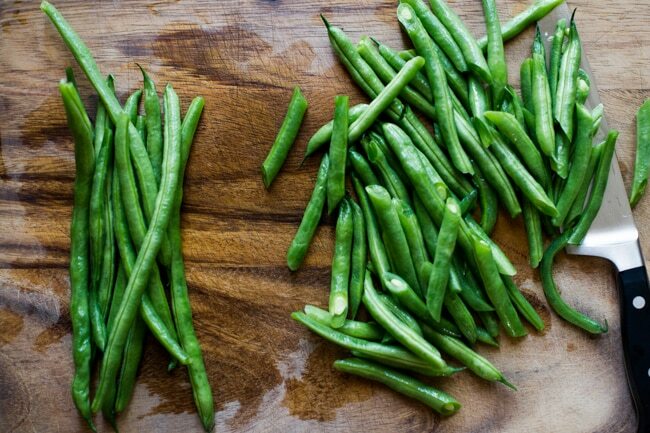 Green beans are one of the best loved vegetables and they always seem to please even the pickiest of eaters. Take for instance, creamed green beans for the holidays. It seems to be one of the most requested dishes for the holiday table that everyone enjoys. How can you not love green beans in a creamy sauce? It’s definitely a household favorite. Stir fried vegetables are also another way to get veggie haters to eat their greens. 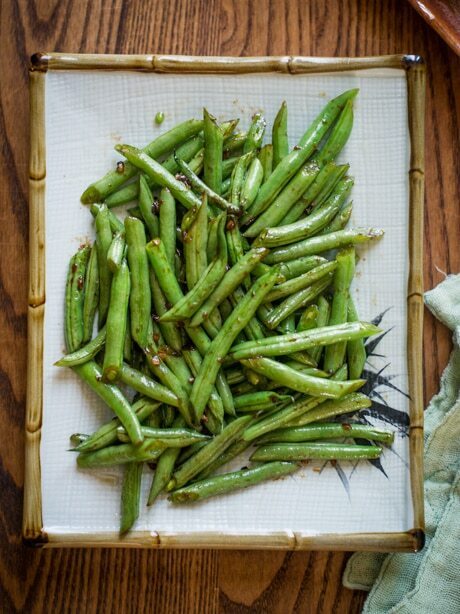 This easy green bean stir fry recipe is an example of the recipe that is enjoyed by many. 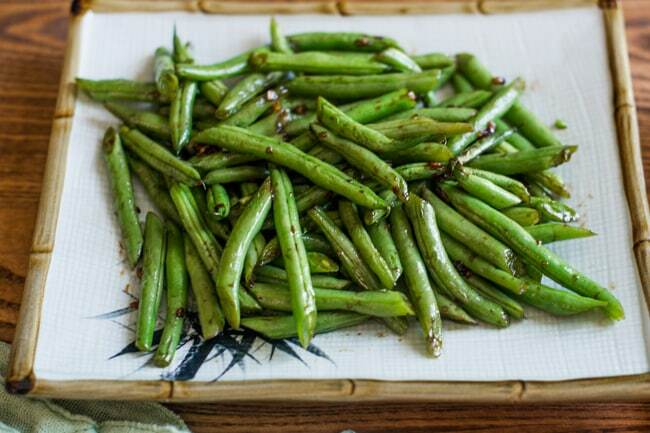 With the added flavors of garlic, fresh ginger and hint of sesame, each green bean is flavored to perfection. Add this sesame green bean stir fry on rice, pasta or even on top of a green salad. It’s even wonderful eaten on its own as a healthy vegetable recipe or low carb vegetable dish. It’s a great alternative to the holidays when you’re needing a vegetable side dish to share. With so much rich dishes during the holidays, it’s refreshing and nice to have a vegetable dish that isn’t laden with cheese. Another option that readers ask for this recipe is if you can add meat. Yes, you definitely can! You can stir fry in some chicken breast, ground pork or ground beef. Shrimp is also awesome for anyone who loves seafood! This recipe is so flexible that you can make it multiple times a week and probably not get tired of it. It’s definitely worth a try because when the season is bursting with green beans, it’s great to have different options so that you can indulge in one of the best vegetables of the season! Recipe note: If making this for vegetarians, make sure to use Vegetarian Oyster Sauce. Regular oyster sauce is traditionally made with oysters (hence the name). 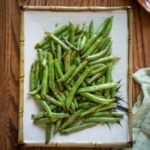 More green bean stir fry recipes, healthy chicken recipes and vegetable stir fry recipes. This recipe was originally published in 2013 and was updated with a new video in 2016. In bowl combine sesame seed oil, soy sauce, rice vinegar, oyster sauce and water. Set aside. Heat large skillet on medium heat. Add the oil, then the garlic. Saute the garlic until it's soft and translucent. Add the green beans, stir and cook for about 2 minutes or until they are almost tender. Stir in the sauce mixture and cook for one more minute. Add black pepper to taste and top with cilantro or sesame seeds. I purchased the green beans to make this a couple of days ago, but didn’t and would like to serve it in another few days, but my green beans definitely won’t be as fresh then. Do you think it would be ok to cook, freeze, and then reheat in a pan? Should I just blanche the green beans and freeze them, then make this with frozen beans, taking slightly longer to heat with the garlic and oil? Yes, blanching them then freezing them should work. But before cooking, make sure to completely thaw out the green beans and gently press out any excess moisture with a paper towel. Have fun and let us know how this method works! Thank you!